At CCC, we’re always telling people to join the conversation. Social media is, after all, about being social. Then one day, a client asked us how, and a light bulb went off. Hey, there’s a blog post in there somewhere! @pet_kon Thanks for the RT, Konstantin! I see that you enjoy traveling. Where's your favorite destination? When you thank people for sharing your content or answer a question that someone’s posed, why not make it personal? Refer to people by their name (spelled correctly). Look at the user’s profile or recent tweets and mention something that catches your interest. It’s a great way to create dialogue and make someone remember you. As you develop relationships, it’s easier to ask about or note something of interest to people you’re routinely conversing with. Until then, make the extra effort; people will appreciate you. Search for popular hashtags and search terms in your industry, so you can check out what people are talking about. (If there are terms you’d like to search consistently, save a search in your social media software or set up a Google Alert.) Join appropriate conversations (not with sales pitches! ), and share relevant discussions with your fans and followers to hear their thoughts. This is a great way to stay on top of trends in your industry, gain targeted followers/fans and discover new business opportunities. 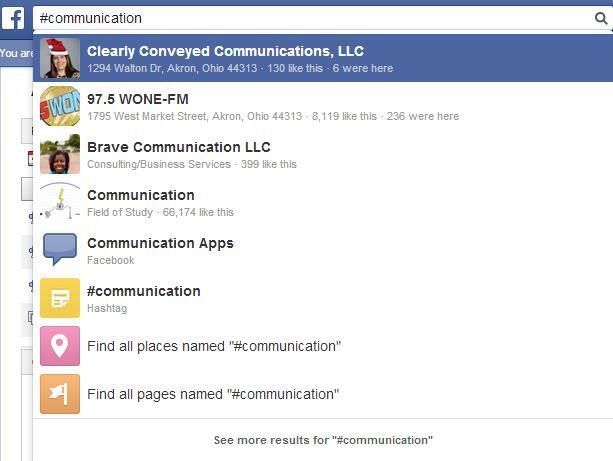 You can search for hashtags and keywords on Facebook too. Searching hashtags is also how you will know which ones to use in your posts to gain the most traction. You can see what type of posts use a particular hashtag if you’re trying to decide between #video, #videooftheday or #videoads, and choose accordingly. It varies with each platform, but generally you don’t want to use more than 2-3 hashtags on a single post. “Overhashtagging” (my word) makes your content difficult to read and turns people off. Remember, space is at a commodity, whether there’s a specific character limit or not. Most people will not take the time to read lengthy social media updates. Related reading: #Hashtags: Big Business or Bust? Talk to people. Answer questions, ask your own. Engage with other users’ content, and encourage others’ to do the same with yours. Don’t just lurk or broadcast information. Social media is a two-way street, not a one-way marketing vehicle. The more you engage, the better you’ll do. Share others’ content. Leave thoughtful comments. Converse. Be social, and others will be social with you. It’s amazing how branching out to other FB pages, Twitter profiles, Google+ pages, blogs, etc. will encourage reciprocation and help you grow your network. So there you have it…. How do you join the conversation? What would you add to this list? Chime in with your thoughts, recommendations and insight below. If you have questions or would like more information on anything mentioned in this post, let us know. We’d be happy to help you join the conversation!